La Maison restaurant on Castlemarket Street has been around since 2009 when it evolved from the popular cafe La Maison des Gourmets. It is under the guidance of Breton chef Olivier Quenet, with Nathan Dimond in charge of the kitchen. Their aim is simple, to produce freshly prepared, classic French food. 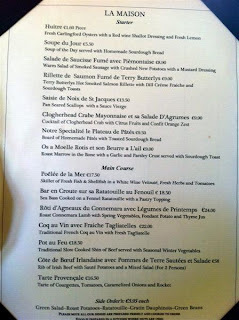 Thanks to deals wesbite Living Social, I had purchased an €80 voucher for La Maison and we set out to use it for an early dinner on a sunny Friday evening at the start of April. As we walked to the restaurant, the streets were thronged with Friday evening drinkers enjoying the evening sunshine. However, it was still a little chilly outside, so I was glad when our table turned out to be upstairs on the first floor of La Maison, rather than outside. The interior of La Maison is narrow, with a view of the kitchen to the back of the ground floor. The decor is classically French in colour, while the first floor is flooded with light from the windows looking out on Castlemarket Street. Although we were seated quickly, it took a while for our distracted young French male waiter to actually come around with the menus. As you'd expect, the menu is packed full of French goodies and features plenty of seafood with scallops, oysters and crab all on offer. I chose Os a Moelle Rotis et son Beurre a L'ail (roasted bone marrow with garlic butter, €9) as my starter, while he chose the Saise de Noix de St Jacques (scallops with Sauce Vierge, €13.50)as his starter. When the starters arrived, we were disappointed to see only 3 small scallops dotted on the plate. Despite a lovely sauce vierge, this was a very meagre portion. 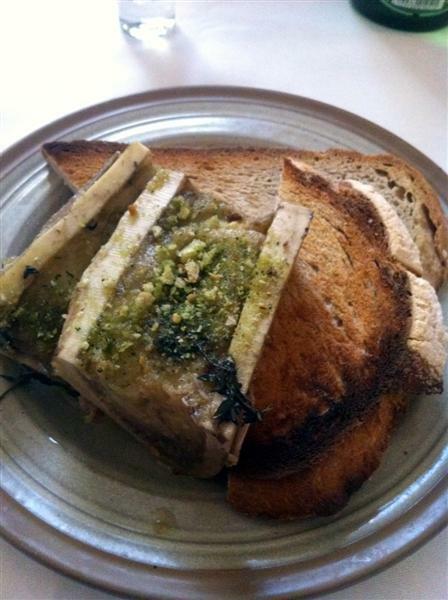 My bone marrow came in two large chunks of bone, served with a slice of toasted sourdough bread. The last time I'd eaten bone marrow was at the fanstastic slow food restaurant Resource in Brussels (unfortunately since closed) and I recalled an unctious gloop, rich in flavour. Unfortunately, I wasn't as impressed with my bone marrow in La Maison. In a stark contrast to his scallops, there was far too much of it to work as a starter, and it didn't feel like it was cooked enough. Once the flavour of the garlic butter had dissapated, I was left with a somewhat unpleasant fatty taste in my mouth. Two disappointing starters (for different reasons) meant that things weren't looking good for La Maison at this stage. 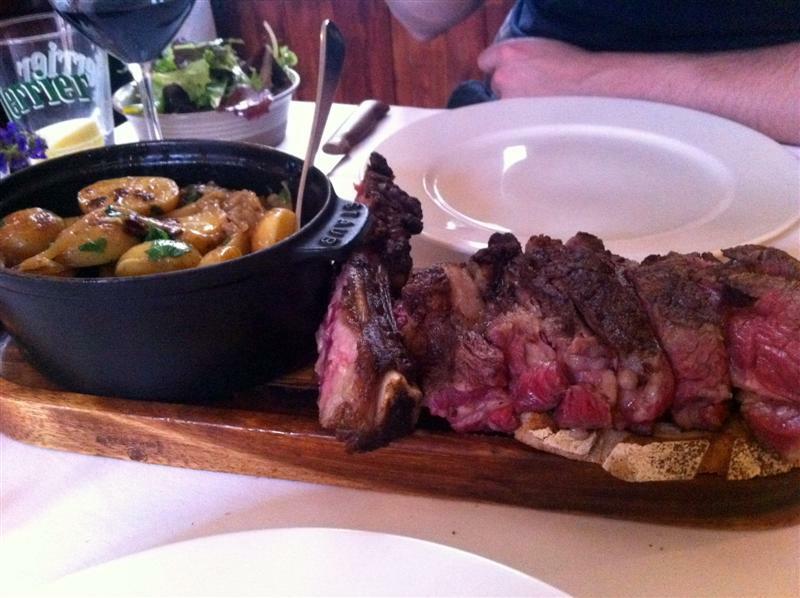 However, we had pushed the boat out when ordering our main having chosen the Cote du Boeuf Irelandaise avec Pomme de Terre Sautee for 2 people (Rib of beef, served with sauteed potatoes and salad, at a stonking €58). At our waiter's suggestion, we ordered this medium rare. Well folks, let me tell you something for free. This is a magnificent dish and it rescued La Maison from the lists of restaurants not to visit again. A lump of sliced rare beef arrived, served on a wooden chopping board, complete with rib bone. The meat was cooked to perfection, still very pink and moist. Alongside was a pot of potatoes and onion with a little bowl of green leaves. The beef had been seasoned and salted prior to cooking, resulting in lovely little crusty bits of flavour. After we finished the sliced meat, we attacked the rib bone, seeking the last little bits of meaty goodness. The potatoes were excellent, served swimming in butter and rich with lovely sweet sauteed onions and garlic. The flavour just got better and better as we worked our way down to the bottom of the dish. For wine, I enjoyed a very refreshing glass of Lombeline Sauvignon Blanc (delicious on a summer evening), while he was not impressed with the Lombeline Grenache-Syrah, finding it rather "meh". Both were priced at €5.50 a glass. Overall, we left La Maison with mixed feelings. Service had been slow, and a bit unresponsive at times and while we simply adored the absolutely carnivourous main course, the starters had distinctly failed to impress. Overall, the prices felt a little too high for the current climate, although I would consider a return visit at lunchtime, when prices should be cheaper. La Maison, 15 Castlemarket Street, Dublin 2. Tel +353 (0)1 672 7258.